I have been finding it difficult to complete some of my stories over the last two weeks. Not for the lack of wanting, but the restrictions I created for myself in damaging my muscles from “over-writing”. You may ask, “over-writing? What is that?” It is similar to tennis elbow. After coming to a conclusion I could not write any more words because the pain was too much, I saw my physiotherapist today and she told me I left it too late and there was nothing to do except sleep and rest. She made me promise to stay away from the computer for two days. 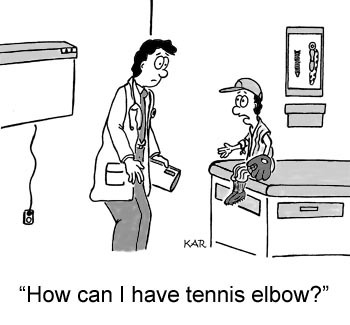 I had the same injury when I actually played tennis over 20 years ago, so I found it amusing. Well, I had to make a post so I’ll be quick and yes, I have taken some pain killers to help. I found this article about my problem and thought, if other writers have the same symptoms, they may find it useful. Over the last few weeks, I’ve felt a nagging and persistent pain in my elbow, right between those two little bones on the underside (if you hold your arm slightly bent). “Tennis elbow” was the first thing that came to mind, but I haven’t played in years. I type, though. A lot. That got me wondering. Is tennis elbow—or “computer elbow”—another painful consequence of the writing life? Turns out, it is. (groan) The good news is you can do things to prevent it, or in my case, speed up the healing process. Other useful website for information on the subject. Yes, this definitely happens – a good idea to do some special exercises when writing a lot! We had an actress teach us some at a writing retreat I went on once. I had a whole day off from writing and all things internet on Thursday – did me the world of good. Good to know. Thanks for sharing. I’m being plagued with arthritis in my hands. Ugh. ❤ does it help to warm it and massage? Oh, the sins of repetitiveness. Thank you for visiting. 🙂 And as you know when you are in the zone, writing an interesting plot – it is too hard to drag yourself away. Thank you Lou. Yes, I feel it in my fingers and hands as well. It really worked for me and I had it really badly. It was back in about 2007, but I still use it on and off and particularly when I’m gardening. They come in different sizes, so make sure you get the right size.